LISTEN to today's show with Dr. Leslie Korn! Revolutionize your personal cooking and eating habits for optimal energy, health, and emotional well-being. 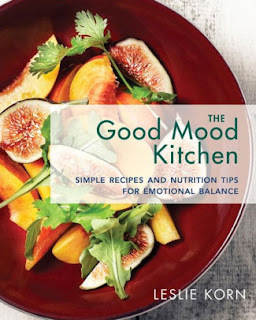 This book of mood-savvy tips, tools, and delicious recipes guides you step by step through all the essentials. It features dozens of easy-to-understand graphics, lists, and charts to help prioritize choices for maximum benefit. Learn how to: Assess your unique digestive style and nutritional needs and develop the diet that’s right for you. Substitute problem foods, ingredients, and habits with healthy, delectable alternatives. Navigate gluten sensitivity and other allergies. Use smarter, healthier food preparation options for busy schedules. Identify common nutritional complications behind depression, anxiety, and other mood challenges. Engage family and friends in nutritional change. And much more. This is the essential dietary road map for anyone interested in improved mental well-being. Explore tasty, life-changing ways to eat healthier―and happier! Hello, I’m Dr. Leslie Korn. I’m a Harvard Medical School-trained traumatologist specializing in mental health nutrition and integrative approaches to treating the mind and body. My life and career has taken me to both Harvard and the jungle of Mexico with many stops in between. I am a passionate advocate for and believer in culturally traditional medicines used by people around the world. My career path began as an undergraduate when I was introduced to yoga and meditation. A Chinese Master, Dr. Ho taught me acupuncture and the I Ching. I penned a letter to my idol Simone de Beauvoir.She wrote me back encouraging me to write. I still have her letter framed on my wall. I’ve since written 6 books with more on the way. At 20, I longed for adventure and self discovery. I traveled to the jungle of Mexico and lived in small Indian fishing village where there was no doctor, roads, or electricity. I started a small elementary school for children. We studied biology at the lagoon and math meant measuring ingredients for cooking. We wrote poetry and danced while listening to Ravel. I got sick with all kinds of odd ailments and the village women taught me their medicine to help me heal and I taught them about reproductive rights and birth control even as the village priest paid me visits to tell me to stop. Thus began my career. I learned natural medicine and indigenous healing rituals. These experiences and studies led to my innovative methods of helping clients recover from trauma and addiction by understanding the mind body and spirit in context of the great quest. The indigenous population traveled by mountain path and canoe to obtain treatment. I funded my clinic by offering training to thousands of health professionals from around the world whose studied bodywork, culinary and herbal medicine, and yoga with me in the jungle. I returned to the jungle of Boston after 10 years and began working on my first master’s degree in cross cultural health psychology. In a public hospital locked psychiatric ward, I did gentle bodywork and rocked schizophrenic women to sleep lieu of their daily sedative. I still teach rocking to clinicians and clients as an important treatment for people of all ages. I returned to the jungle for 2 years and then again.. I always returned to Boston to treat clients and my clinical practice was filled with dozens of psychiatrists who in turn referred their patients who were cutting, burning, purging, and generally traumatized, to receive bodywork and body-centered psychotherapy, nutrition, and to learn yoga to alleviate their distress. I have written up these many case stories in my published books. I accepted a clinical fellowship at Harvard Medical School. While there, I brought bodywork therapies into outpatient psychiatry and further developed my theories and practice of Mind Body therapies for the treatment of PTSD. I was appointed as a clinical supervisor, but I longed for the jungle of Mexico and my patients there and left Harvard. Thirty years ago, I began working with the first of several of my therapy dogs and I continue to present workshops on how therapy dogs help to restore touch and sensation with children and adults who have been traumatized.